These delicious gluten free enchiladas are vegetarian, but you can make them with meat if you’d prefer! One of the best things about southern New Mexico is the food. Tacos, huevos rancheros, and enchiladas – they are staples in the local cuisine. I made gluten free enchiladas pretty often when I lived in New Mexico because they are easy, filling, and delicious. When I travel home, I stock up on the foods I can’t find here, and usually come home with a stash of Hatch canned green chile. (You can get them on Amazon in the UK but they are insanely expensive.) On my last visit home, I picked up a can of Hatch green chile enchilada sauce after noticing it is labeled gluten free. (Note: I noticed some gluten-containing Hatch enchilada sauce on Amazon, so make sure you’re getting the gluten free version! Interestingly, they only show gluten free options on their web site, so buying direct might be the better option.) Hatch brand seems to be making an effort in the gluten free market, which is awesome to see. In New Mexico, they are in all the grocery stores, but I’m not sure how easy they are to find across the United States. If you have seen Hatch products in your area, let me know in the comments! 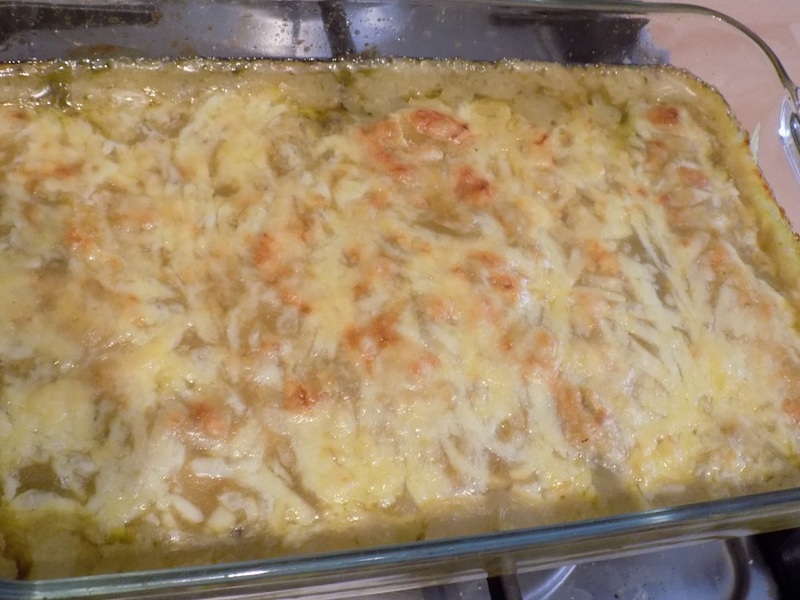 Since my partner is vegetarian, I thought I’d share my recipe for zucchini enchiladas, but it can easily be made with meat as well. Here we go! Fry the onion in the oil over medium-high heat. Add the zucchini, stirring often to prevent burning. After about two minutes, the zucchini should be cooked some, but still kind of firm. It’s going in the oven and will finish cooking there, we’re just trying to get some of the water out. Add half the salt and garlic powder and mix to combine. Turn off the heat. Meat option: fry the onion as above. Instead of the zucchini, add the meat to the pan and warm the meat through. Turn off the heat. Add the cream, can of diced green chile, remaining salt and garlic powder, and black pepper to the pan and stir to combine. Preheat your oven to 375F (190C). Lightly grease a *casserole dish . Just a little toasty on top – perfect! Roll your enchilada filling in the tortillas. You’ll use roughly two tablespoons of filling per tortilla. Place the filled roll seam side down in the casserole dish. Continue rolling the filling in the tortillas until you’ve used everything up – the bottom of the dish should be covered by the eight rolled tortillas. (Don’t worry if your tortillas crack or break during this process, just try to make sure you have tortilla on the bottom and top of the filling.) Pour the entire can of enchilada sauce over the rolls, covering everything (no dry spots!) Then cover this with the cup of shredded cheese. Bake uncovered for 25-35 minutes; when the cheese starts to get slightly brown and toasty looking, it’s done. Serve with beans, rice and/or salad. 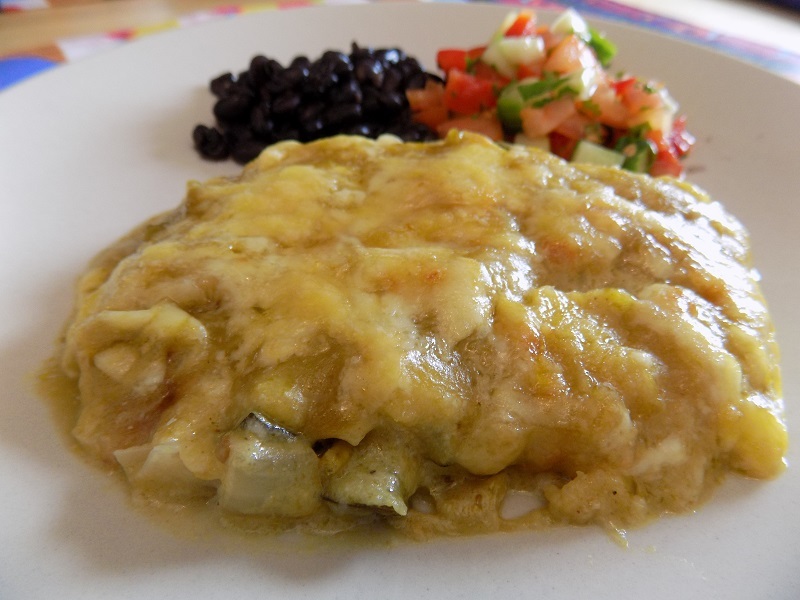 Some people like to top their enchiladas with raw diced onions or a fried egg. I like to put a dollop of sour cream on top. How do you like your enchiladas? What’s your answer to New Mexico’s state question: red or green?